SAFI - The Blood Purifier is one of the very old, popular & Ayurveda herbal beauty tonics in India since decades. Safi is known to be Unani medicine and is made of all natural and herbal ingredients by Hamdard Lab. It is a great for skin related disorders such as acne, pimples, boils, skin rashes, blemishes, urticarial etc. Also helps with nose bleeding, cures constipation, corrects indigestion, improves complexion and helps you to stay slim and smart. Ingredients: All natural and herbal. Recommended dosage varies for adults & children. 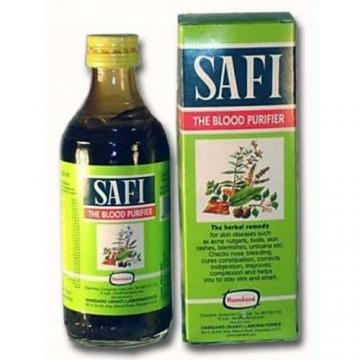 Buy Hamdard Safi Syrup Natural Blood Purifier 100Ml, sold & shipped by Mahavir Wholesale where you can shop online for Grocery Products of India - Patanjali, Chai, Henna & Beauty Items. This Hamdard Product collection has been tagged as Health, Herbal Acne Solution, Ayurvedic Remedy Products, Natural & Alternative Treatment, Hamdard Brand Product.